Thalassolituus spp. belong to the Oceanospirillaceae of Gammaproteobacteria. The genus was first described by Yakimov et al. (2004), and is currently composed of two type species, T. oleivorans and T. marinus [1,2]. 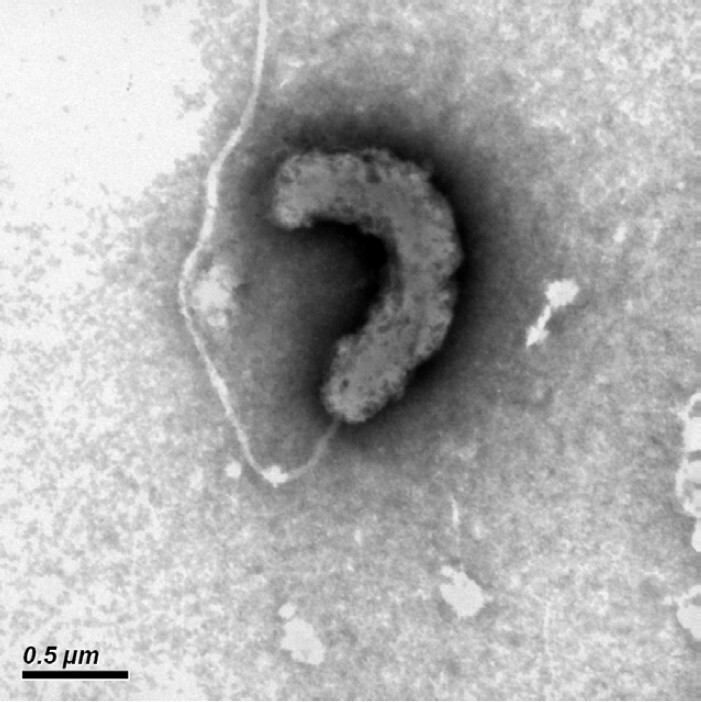 Bacteria of this genus are known as obligate hydrocarbonoclastic marine bacteria . Previous reports showed that Thalassolituus-related species were among the most dominant members of the petroleum hydrocarbon-enriched consortia at low temperature [4–7]. In addition to consortia enriched with oil, Thalassolituus spp. can be detected in variety of cold environments as well [8–10]. Strain R6-15 was isolated from the surface seawater of the Arctic Ocean after enriched with crude oil during the fourth Chinese National Arctic Research Expedition of the “Xulong” icebreaker in the summer of 2010. 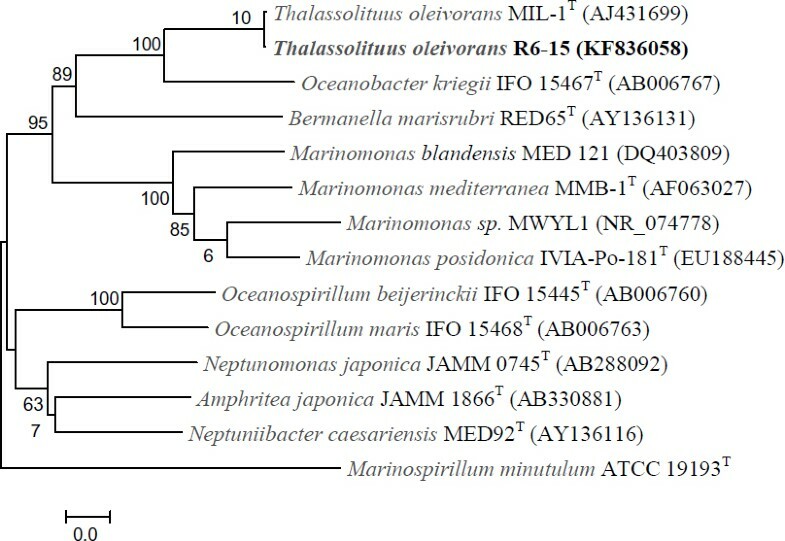 The 16S rRNA gene sequence shared 99.86% and 96.39% similarities with T. oleivorans MIL-1T and T. marinus IMCC1826T, respectively. 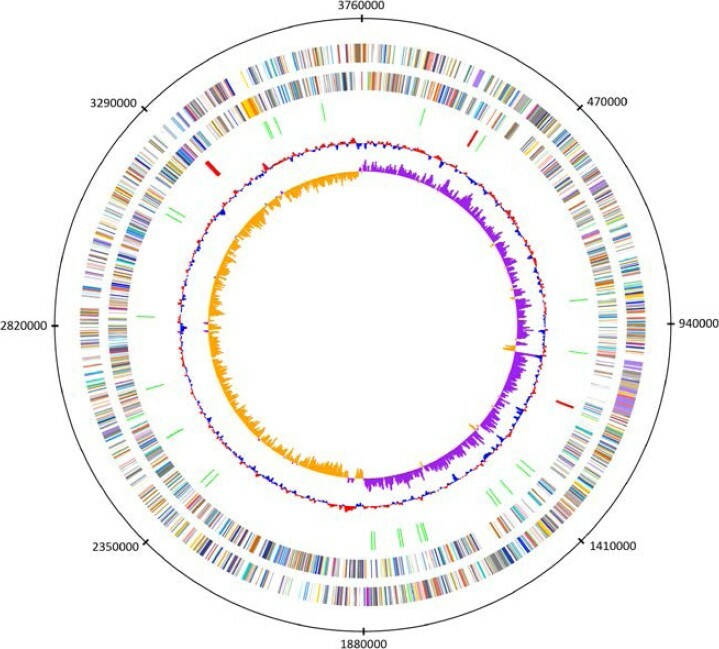 Pyrosequencing results (16S rRNA gene V3 region) of fifteen oil-degrading consortia across the Arctic Ocean showed that the dominant member in most of the consortia shared identical sequence of this strain, comprising 8.4–99.6% of the total reads (not published). T. oleivorans R6-15 is closely related with T. oleivorans MIL-1T (Figure 1, Table 1). The strain is aerobic, Gram-negative and motile by a single polar flagellum, exhibiting a characteristic morphology of a curved rod-shape cell (Figure 2). Strain R6-15 is able to utilize a restricted spectrum of carbon substrates for growth, including sodium acetate, Tween-40, Tween-80 and C12–C36 aliphatic hydrocarbons. Its growth temperature ranges from 4 to 32°C with optimum of 25°C. Strains: 1, T. oleivorans R6-15; 2, T. oleivorans MIL-1T; 3, T. marinus IMCC1826T. +: positive result, −: negative result, w: weak positive result, na: data not available. This work was financially supported by the National Natural Science Foundation of China (41206158), the China Polar Environment Investigation and Estimate Project (2012–2015), and the Young Marine Science Foundation of SOA (2012142).